Your kitchen bar or counter will get more use with comfortable seats like the Amish Bow Back Swivel Barstool providing seating. A favorite of Windsor furniture, the bow back features one steam bent piece of wood that curves beautifully over its collection of spindles. 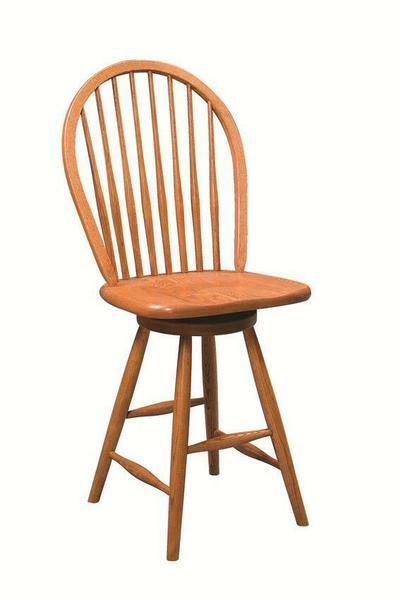 The Amish Chassell Windsor Swivel Barstools are available in your choice of oak, brown maple or cherry wood. Windsor furniture is big on comfort and blends beautifully in country style kitchens. These bar stools feature straight leg style with stretchers to tuck your feet on. If you need help choosing wood or finish, please don't hesitate to get in touch. Our team of Amish Furniture Specialists is happy to help you. Thank you for shopping at DutchCrafters.